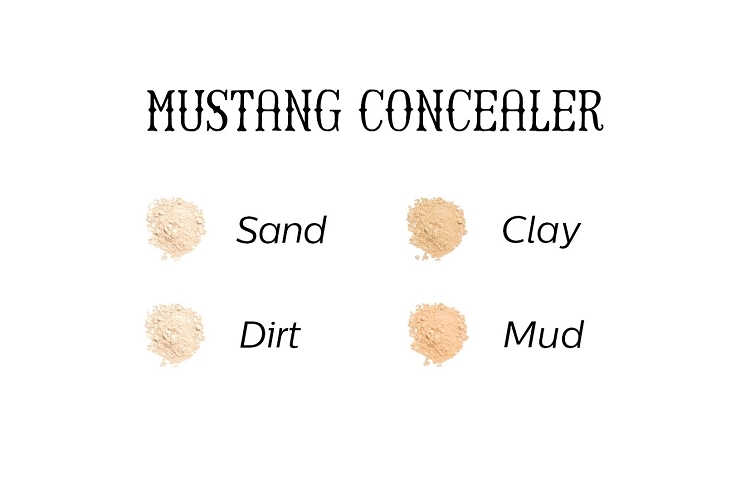 Conceal blemishes and illuminate your face with Cowgirl Dirt's new Mustang Concealer. This color corrector hides the dark circles and brightens the eyes. The unique lightweight but concentrated powder is perfect for smoothing the complexion and covering skin imperfections. Use with Concealer Brush for seamless results. This concealer works well on red areas - corners of the nose, blemishes, and some dark spots. I like that it goes on quick with a little brush and I usually don't have to layer it. It does not work well on the under-eye circles, which require a different colored concealer. Try the under-eye highlighter if you need to cover your bags! I love this product! It covered everything a lot better than other concealers I have used in the past. Definitely a must! I thought that, while it is light coverage, this concealer was great for dark circles, due to it's yellow tone. I'm wondering if I were to moisten it a bit, perhaps it would give a bit heavier coverage and be a more multipurpose. I'm going to go ahead and try out the full size. The only reason I'm giving it 4 instead of 5 stars is because it isn't very multipurpose-like for concealing blemishes and the like, but I suppose it does state that in the discription, so it is not surprise.